When I started using my SmoothSkin Muse about twelve weeks ago, I made a joke on my instagram account about being hair free for Christmas and how liberating that would be. Now I’m at the end of my trial period, I can tell you: I’m almost there, and it’s actually pretty damn liberating indeed. Don’t get me wrong, I don’t cast any aspersions on anyone who might want to keep all their hairs where nature put them – but I’m not one of those people. I like the slip of my leg sliding into clean sheets without any fuzzy resistance, and the joy of not having to keep tweezers on every table in the house in case I find a pesky whisker. That said, even after my efforts, I’m not happily bald as a coot, bodily (more’s the pity). My underarms have given up, and my bikini line is about there, but I still am battling some leg hairs, primarily because I think my IPL-ing technique leaves something to be desired and I’m quite sure I missed patches. 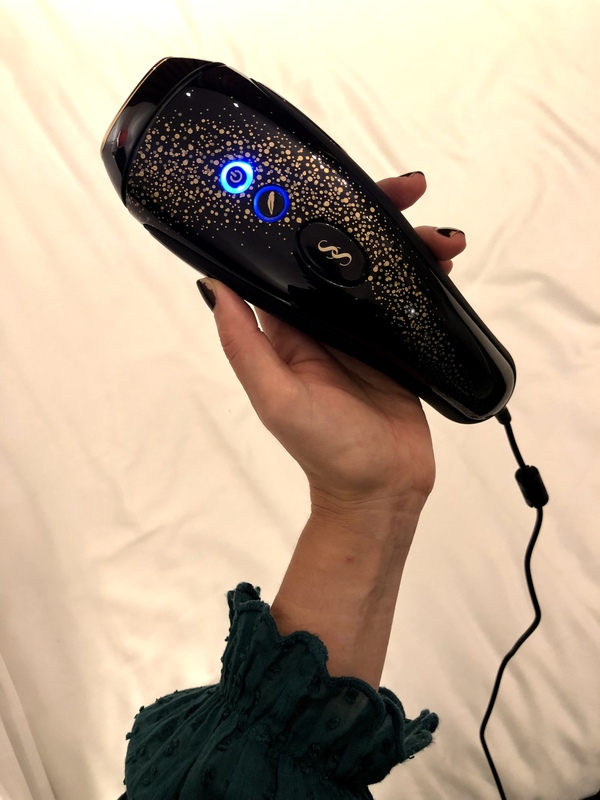 And this leads me to the real nugget of advice I want to give you if you opt to buy a SmoothSkin yourself (and if you do, make sure you use the discount I’ve got running, here): the device only works if you use it, each week initially and whenever you have hair sprout up thereafter. If you miss patches as I clearly have, they will of course still grow hairs. And if you don’t have skin that’s paler than your hair, you can’t use it. Also, you will have to accept the nuisance of shaving first and contending with stubble for the early period. This is especially annoying if you have a stubborn moustache, but in my experience well worth the bother. In essence, it boils down to this: the right person, using it diligently, will see excellent results. I’m really enormously impressed with the reduction in hair I’ve seen and have no reservations in recommending that you buy if it, like me, you’re hirsute and wish not to be. As mentioned above, I have a discount currently running so if you’re going to buy one and want to save some money, do use that code. But I also have one final device to giveaway, so if you’d like to win, please tell me in the underneath comments field about your biggest beauty battle. It doesn’t have to be hair – I just want to know what irritates you on a near daily basis, if anything. If nothing, tell me that too (also: lucky you!). This giveaway is open to UK residents only and the winner will be picked and notified on the e-mail address they enter before leaving their comment on the 17th of December. This post is part of my sponsored activity with SmoothSkin. Pesky blackheads! Oh and milia! Milia is annoying – don’t try to get them out yourself! It’s the chin hairs – god help the person who loses my tweezers! Ha – yes, I also get annoyed when other people use mine in case they are blunted! Definitely hair…shave shave shave, and the next day it’s back! I’ve been there. IPL is great for it. My greasy hair is the thing that irritates me the most, no matter what I use on it nothing seems to work. Have you tried a clarifying rinse? Some brands make ones for weekly use and they work well. Also, scalp scrub. Christophe Robin and Ouai make good ones. Blackheads on my nose! urgh.. I am at war with my terrible English chicken-flesh upper arms. Daily exfoliating and moisturising has smoothed away the bumps, thank goodness, but they still look like two rolls of corned beef unless exceptionally tanned, which happens rarely. Ah well. Thank God for sleeves. Oh yes that’s a difficult one if it bothers you. Fake tan?! I got my dad’s rubbish eyesight while my siblings enjoy perfect vision. Annoying, that you don’t get to pick and choose bits! My big beauty bug is facial hair, I have tweezers in various places at home, its the unwanted beard and mustache, I can’t use anything on my lip as Ive sensitive skin, so I have to shave it off. Im not a make up person, but goodness I have no wish to be a bearded lady! I have a pair of tweezers on every surface of my house. Facial hair is hugely irritating. Because I have seen you in the flesh many times I can tell you that your pores are fine – you have amazing skin. Capillaries and vascular skin is annoying but can be beaten! Hair! Stray eyebrows, whiskers, fuzzy legs, unruly bikini line. It’s my biggest woe. Hair! Stray eyebrows hairs, whiskers, fuzzy legs, unruly bikini line. It’s my main beauty woe. I hear ya. IPl is amazing for it. Ingrown hairs! And not the satisfying kind you can dig out either. Oh ones you can dig out at the best. Those ones that stay embedded are maddening. My biggest beauty battle is the reoccurring spots on my chin! Do you know if they’re hormonal? Mine were. I have NO IDEA, but mine did/do the same. Hair, hair, hair! From facial hair to hairy legs! PCOS sufferer! I have to shave, pluck, wax and thread and it’s a nightmare! I’ve been there! IPL has saved me from endless work! I have pcos so hair is a thing for me. Especially upper lip hair and I have struggled with what the hell to do about it since my teens. I still don’t have the answer! IPL is definitely the one if your hair is darker than your skin. I have PCOS and all the hells of it and it has worked so well for me! My eyebrows have growth accelerant in them I am sure. I can have them either waxed or threaded & with a couple of days they seem as bushy as ever & I am back to trying to tackle them with tweezers almost every day. Annoying – but I wouldn’t mind if my brows were as hardy as my other hairs. I plucked one patch in the ’90s and it STILL refuses to grow back! I’m in the process of maybe being diagnosed with PCOS and have all of the unpleasant appearance-based side effects going. Worst would have to be the chin and jawline acne because it’s un-hideable. Just when I think it’s disappearing and I can concentrate on fading hyperpigmentation, more springs up (usually just before a big event to spite me.) It’s like it KNOWS. For me – ever since I was 4 and a mean, very fair girl commented on it – I have been self-conscious about my body hair – arms, moustache and legs particularly… But my military management of it via waxing has had to stop due to pergnancy-related varicosities which mean I cannot rip the skin willy-nilly anylonger. I still subject my upper lip to it, but it often breaks out, and by the time this heals, I need to de-fuzz it again. Woe is me. Oh I know this one all too well – exactly the problem I had. It really does affect confidence. And the winner is Emma – Emma, send me your details to madsabouttown@gmail.com and I’ll make sure you get your device. Thank you to everyone for entering!